Jean Gagnon (1998). Dionysus and Reverie: Immersion in Char Davies's Environments. Through her interactive, immersive virtual environments (virtual reality, three-dimensional space, and real time), Char Davies offers us a new experience of cinema. She plunges us into what is essentially a new kind of cinematic apparatus, and in the process reveals a passion she shares with a long line of cinematographic forebears—the passion for summoning up phantoms, for creating magical visions and enchanted realms. This line of descent, both technological and conceptual in nature, stretches from the very first attempts to project moving images right up to the latest developments in film and video. Ephémère (1998) provides an experience that is more like a reverie than a dream, and it is an experience that is firmly grounded in the body. 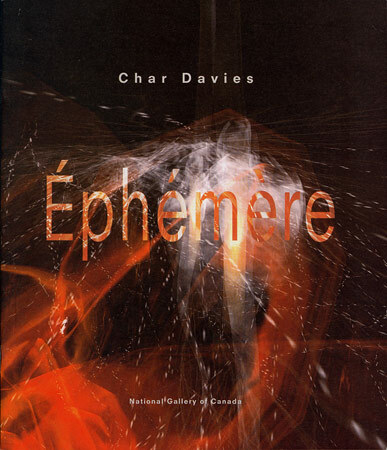 In Ephémère, Char Davies provides participants with a paradoxical sense of embodiment and self awareness: the body is no longer relegated to playing a role in some fantasy of omnipotence, as is so often the case with applications of digital technology seen in the mass media and in interactive video games. The joy and euphoria, the feelings of freedom and loss which frequently follow the experience, testify to an erasing of the boundaries of the self, replaced by a sense of fusion, a wholeness of being. Such feelings call to mind the ancient cult of Dionysus, who is associated in myth and legend with the intoxication induced by the fruit of the vine and by the renewal of nature in springtime. In a remarkable book that has been unjustly neglected since its publication in 1967, the French philosopher Jean Brun makes this connection between Dionysus and technology—a connection which at first seems outlandish, in light of the traditional association of this god with drunkenness and orgiastic practices. In Le retour de Dionysos,  Brun shrewdly argues that "ultra-media"—what today would be called digital media—have something of the Dionysian about them because they are instruments of couplage and combination, echoing the myth of the god torn limb from limb by his frenzied votaries, then reassembled and reborn. According to Brun, the figure of Dionysus helps explain the relationship that has arisen between art and technology since the nineteenth century, paralleling the development of photomechanical, electrical, electronic, and digital methods of processing sound and image. The digital media are Dionysian in that they abandon the integrity of the single sound or image in favour of fragmentation, mixture, collage, and "musical" assemblage combining sound and image. But something is missing from the portrait sketched by Jean Brun: the figure of Apollo. Oil on canvas, 35.5 x 45.7 cm. In the last century, Nietzsche's aesthetics established an indissoluble connection between Dionysus and Apollo. Following Schopenhauer, Nietzsche made Dionysus the god of music, or at any rate the god who presides over the ecstasy that music produces. According to Nietzsche, music alone among the arts is a representation not of objects but of flux, the principle of energy, the will; music moves and animates the human world. As early as 1872, in The Birth of Tragedy, the visionary Nietzsche called attention to what would be a major preoccupation of the twentieth century: the relation of music to image and concept. And for Nietzsche, Apollo was the necessary complement of Dionysus in Greek tragedy. The god of dreams and of the visible world, Apollo guards the frontier between dream and hallucination, presides over prophecy, and is ruler over what Nietzsche calls "fair appearance"; measured restraint makes him the ethical deity, and his wisdom is founded on serene calm. Dionysus, god of delirium and ecstasy, brings excess in his wake, and his actions lead to disintegration, dismantlement, and dispersal, through which he is restored to the flux of life. But for Char Davies, ecstasy is also a way of "standing outside" time, and thus a way of questioning our relation to the temporal. In this case, the Dionysian is expressed through the abolition of spatio-temporal limitations. Ephémère is also a reflection of transience, of things that disappear as soon as they come into being, of the present moment constantly passing away and renewed in a future to come. To respond to this paradox of time, Davies chooses the lyric and poetic mode, rather than the epic and narrative. Dionysus has little to do with narrative discourse, for he induces modes of being in which time is no longer governed by verbal categories of action. Ecstasy as a mode of being is problematic for any phenomenology of the experience of time. The metaphors Char Davies chooses to guide participants, "immersants," in their navigation is hardly surprising. The artist evokes underwater diving to emphasize the crucial importance of breathing in participants' experience; they wear a helmet-like headset, are guided by a point of light that is also a source of energy, and seem to be surrounded by a vast aquatic environment. Through the rhythm of their breathing, participants are able to access states of consciousness that subvert their customary relation to their bodies and to time. While Ephémère situates them in virtual reality, it nonetheless allows them a complete experience of their bodies in relation to the mind and the phantasmagoric environment with which it is preoccupied. 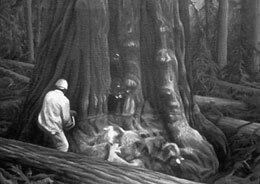 The artist draws participants into a fluid, translucent world, avoiding the shoals of hard-edge representation, bypassing the figure-ground gestalt. The fluidity of this audiovisual world leads to an overflowing of the self beyond its normal boundaries and a feeling of ecstasy; at the same time, breathing, which is essential to inhabiting this virtual reality and moving about in it, requires self-control and a keen awareness of the body. And reverie, like breathing, contains an element of self-control. In her notes, Char Davies does not hesitate to quote Heidegger, who in his famous work on technique [technology]†  observes that for the Greeks one form of techne was poiesis (the revealing of the thing present). This notion of poiesis is also found in the work of Gaston Bachelard, in the guise of the poetic effect. 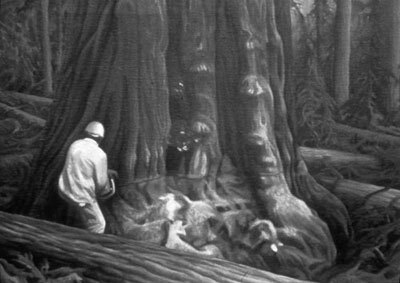 Film has often been compared to dream, but in the light of Bachelard's Poétique de la rêverie, we should perhaps, in the case of Char Davies's immersive and enveloping works, speak instead of a dynamic of reverie from which there arises what Bachelard calls "psychotropic images that stimulate the mind by drawing it along in an unbroken movement." Concerned with poetry and material imagination, Bachelard sees the poet as one who invents "augmentations of the human." Char Davies seems to harbour the same poetic concerns. In fact, her immersive environments share this poetic of reverie in the exact sense of Gaston Bachelard's observation that the cogito is present in reverie but absent in dreams. While the dreamer is not aware of dreaming, anyone who voluntarily enters a peaceful state of reverie is certainly aware he is daydreaming. For Bachelard, nocturnal dreams do not display any attempt at individuation; he adds that even when reverie gives the impression of a flight from reality, beyond time and space, the daydreamer knows that it is he himself who is fleeing, he, in flesh and blood, who is becoming a "spirit," a phantom of the past or a ghostly voyager. In Char Davies's installation, where regular, controlled breathing is crucial, the self-awareness so characteristic of reverie ensures the maintenance of identity and individuation (concepts which Bachelard borrows freely from Carl Gustav Jung); and through them, Apollo is also manifest in these works, counterbalancing the Dionysian impulse. Virginia Rutledge, a subtle observer of the technological arts, states that "Osmose  promotes a sense of envelopment and fluidity that I heard several users describe (pace Luce Irigaray) as feminine,"  avoiding the so-called "masculine" concerns found especially in video games. Bachelard places reverie in the province of the anima and the feminine, and under the governance of what he calls "the being inhabiting our still waters." Char Davies's works are proof that the new high technology so commonly associated with the male world and masculine toys can be used in the service of a different aesthetic, and that poetic principles appropriate to that aesthetic can in fact exist. It is not so easy to get away from the gender of art, or of technology! 1. Char Davies, "Changing Space: VR as an Arena of Being," in The Virtual Dimension: Architecture, Representation and Crash Culture, ed. John Beckman (Boston: Princeton Architectural Press, 1998). Preliminary version published in Consciousness Reframed—Art and Consciousness in the Post-biological Era: Proceedings of the First International CAiiA Research Conference, ed. R. Ascott (Newport: University of Wales College, Centre for Advanced Inquiry into the Interactive Arts, 1997). 2. See Jean Gagnon, "Dionysus in Wonderland: A Few Musical Metaphors in Techno-Culture," in Clicking In: Hot Links to Digital Culture, ed. Lynn Hershman Leeson (Seattle: Bay Press, 1996), pp. 291-305. 4. Martin Heidegger, "La question de la technique," in Essais et conférences (Paris: Gallimard, 1958), pp. 9-48. 5. Gaston Bachelard, La poétique de la rêverie (Paris: PUF, Bibliothèque de philosophie contemporaine, 1968), p. 130. 7. Ibid., p. 129; emphasis mine. 8. "Reality by Other Means," in Art in America LXXXIV:6 (June 1996), p. 39. 9. Bachelard, La poétique de la rêverie, p. 60.